Things are craaaazy. 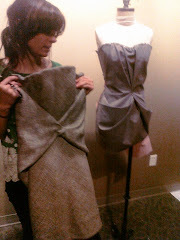 I have been cutting, sewing and pattern making, trying to get everything ready for Omaha Fashion Week Finale on Saturday. If you live in the Omaha-area, make sure you buy tickets and come. It is expected to be a very exciting event. I spent last week in NYC preparing my textile collaboration collection to show at Mercedes-Benz Fashion Week. I have some special backstage photos to share with you when things get a little less laborious. Also, be sure to check out the other designers showing all this week. Every night there is a fun event and runway show at Nomad Lounge. View the program here.